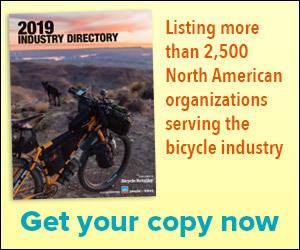 SAN JUAN CAPISTRANO, CA (BRAIN)—Nielsen Media, parent company of Interbike, and the Bikes Belong Coalition, the bike industry's advocacy group for the United States, today announced a significant 10-year, multi-million dollar alliance that will boost efforts to get more Americans riding bicycles. BOULDER CITY, NV (BRAIN)—Interbike show organizers have relocated the Outdoor Demo exhibition, which will be held Sept. 24-25. LAGUNA HILLS, CA (BRAIN) —Outdoor Demo Calendar: Deadline is Thursday, September 6. Interbike Show Daily Calendar: Deadline to ensure inclusion is September 7. We will continue stuffing items in after that until we run out of time or room. First-come, first in. SAN JUAN CAPISTRANO, CA (BRAIN)—Interbike has extended free online registration for attendees and buyers to 11:59 p.m. tomorrow, Friday, Sept. 7. The original deadline to avoid a $25 late registration fee was Friday, Aug. 31.